Definition: A multiplexing technique by which multiple data signals can be transmitted over a common communication channel in different time slots is known as Time Division Multiplexing (TDM). It allows the division of the overall time domain into various fixed length time slots. A single frame is said to be transmitted when it’s all signal components gets transmitted over the channel. As we know, multiplexing allows the transmission of several signals over a common channel. However, one may need to differentiate between the various signal for proper data transmission. So, in time division multiplexing, the complete signal gets transmitted by occupying different time slots. The name itself is indicating here that basically time division is performed in order to multiplex multiple data signals. Let us have a look at the figure below in order to have a better understanding of the TDM process. As we can see that source A, B and C wants to transmit data through a common medium. Thus, the signal from the 3 sources, is divided into multiple frames each having their fixed time slot. Here, 3 units from each source are taken into consideration, that jointly form the actual signal. A frame is transmitted at a time that is composed of one unit of each source. As these units are entirely different from each other thus the chances of unnecessary signal mixing can be eliminated. When a frame gets transmitted over the particular time slot, the next frame uses the same channel to get transmitted and the process is further repeated until the completion of the transmission. Here, we have taken the example of 3 different sources, but one can perform multiplexing of n source signals. 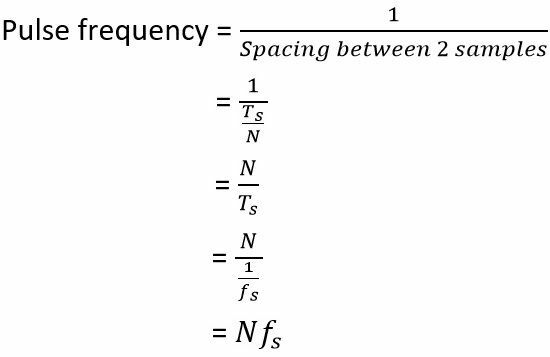 It is noteworthy here that units of a single source must be equivalent to the total number of source signals to be transmitted. Both analog and digital signals can be multiplexed using time division multiplexing, but its processing technique allows the multiplexing of digital signals conveniently rather than analog one. The figure below shows the block diagram of a TDM system employing both transmitter and receiver section. The technique efficiently utilizes the complete channel for data transmission hence sometimes known as PAM/TDM. This is so because a TDM system uses a pulse amplitude modulation. In this modulation technique, each pulse holds some short time duration allowing maximal channel usage. Here at the beginning, the system consists of multiple LPF depending on the number of data inputs. These low pass filters are basically anti-aliasing filters that eliminate the aliasing of the data input signal. The output of the LPF is then fed to the commutator. As per the rotation of the commutator the samples of the data inputs are collected by it. Here, fs is the rate of rotation of the commutator, thus denotes the sampling frequency of the system. Suppose we have n data inputs, then one after the other, according to the rotation, these data inputs after getting multiplexed transmitted over the common channel. Now, at the receiver end, a de-commutator is placed that is synchronized with the commutator at the transmitting end. This de-commutator separates the time division multiplexed signal at the receiving end. The commutator and de-commutator must have same rotational speed so as to have accurate demultiplexing of the signal at the receiving end. According to the rotation performed by the de-commutator, the samples are collected by the LPF and the original data input is recovered at the receiver. In this way a TDM works. Now, as we have considered that there are N input channels, then one sample is collected from each of the N samples. For a TDM signal pulse per second is the signalling rate denoted as ‘r’. 1. Synchronous TDM: In this technique, the time slots are assigned at the beginning, irrespective of the idea about the presence of data at the source. This leads to the wastage of the channel capacity. As in the absence of any data unit, that particular time slot gets entirely wasted. As it leads to exhaustion of the time slot in the absence of any data unit thus, the technique is considered to be efficient. 2. Asynchronous TDM: It is also termed as statistical or intelligent TDM technique as it eliminates the drawback of wastage of time slot present in synchronous TDM. Here, a particular frame is transmitted by the transmitting end only when it gets completely filled by the data units. It exhibits higher efficiency than that of synchronous TDM technique as it requires smaller transmission time and ensures better bandwidth utilization. It uses entire channel bandwidth for the transmission of the signal. The problem of Intermodulation distortion is not present in TDM. Pulse overlapping can sometimes cause crosstalk but it can be reduced by utilizing guard time. Thus, is not much serious. The transmitting and receiving section must be properly synchronized in order to have proper signal transmission and reception. Slow narrowband fading can wipe out all the TDM channels. TDM finds its application mainly in a digital communication system, in cellular radio and in satellite communication system.